The island of the sun. An average 300 days of sunshine a year!! Rhodes is the furthest south eastern island of Greece. it is a very popular, cosmopolitan island, where both Venetian and Turkish influence are apparent, giving it a special charm. Apart from the main harbour of Rhodes, where the magnificent statue of the Colossus once stood, you will find many picturesque, little coves, where you can swim in magical surroundings. Lovers of history will be drawn to the remarkable monuments all over the island, signs of its long past. 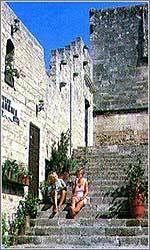 It's fascinating to walk in the medieval town, full of impressive 15th-century buildings, stone-paved lanes with arches and vaults, rows of little shops - as a modern touch to the medieval picture - offering a surprising variety of commodities. 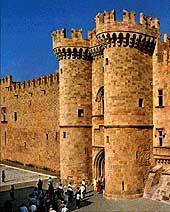 Although ancient Rhodes was a large city relatively few ruins have been found. The ancient Acropolis stood on the eastern city of the Monte smith hill, overlooking the city. Further on one sees the Stadium (3rd century BC) and the curiously square sized Odeum (both rebuilt). Performances of ancient drama are held every summer in the Odeum. 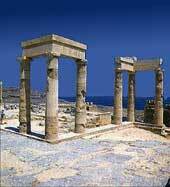 There are also a few ruins of the temples of Polias Athena, Pythian Apollo and Zeus. Kalithea, Faliraki, Afantou, Kolimbia, Tsambika, Agia Agathi, Haraki and Plimmiri are some of the beautiful beaches of Rhodes. Windsurfing.If you don't have a surfboard, you can rent on the island. Also you can play tennis, Golf and water-ski. Everything you could ask you'll find it here.Discos, bars, pubs and a Casino, are doing their best to give you a great time. Mandraki - The main harbour of Rhodes. You cab tie on the N or the N end of the E quay. You will find the harbour can be fairly crowded and there is often four boats out from the quay. The harbour offers good shelter from prevailing winds. There is water and electricity available at the quay as well as fuel. All provisions can be found. Lindos – You can moor where convenient in this large bay. The water is turquoise and offers an excellent area for a swim. Take the time to go ashore to visit the acropolis it is well worth the visit.